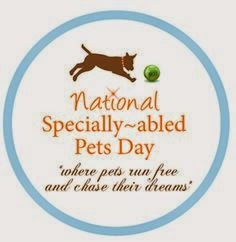 White Dog Blog: Specially-Abled Pet Day!! When I let go of expectations, they accomplish things that far exceed anything I thought possible. It is people who limit their animals with their own feelings of fear or doubt. They need to be nurtured and protected, yet encouraged to fulfill their true potential. Give them the freedom to be just like other dogs and to enjoy their lives to the fullest. Their “disability” is just a difference, nothing more, nothing less. I have missed out on a whole world of information that I don’t need my eyes or ears to notice. Now I pay more attention to subtle things in my day. I’ve learned to be humble. Sometimes the dog knows or notices things that I don’t. I’ve been connected to some amazingly wonderful people and animals that share our journey with their own specially-abled pets. I would not have met these friends if it weren’t for my dogs. I started and keep this blog as a resource for others. I hope they can learn from my journey. Love is stronger than any problem that may arise. Looking lovingly into your dog’s eyes is not dependent on the fact that she actually has eyes – it is about so much more than that. It is a recognition of her soul and its connection to my soul. A blind and deaf dog KNOWS when I open the refrigerator in the next room, and she can move at lightning fast speed to get herself in the way of the door closing, even when I thought she was sleeping! Specially-abled dogs give us a way to connect to and teach compassion and acceptance to others. While we often are afraid to approach a person who is different from us, something about a dog draws us in and we feel safe. These lessons can carry over to the people in our lives. They want the same things that we want in our own lives – love, safety, and acceptance. They want a chance to do things for themselves. They don’t want our pity. There are always many ways to accomplish the same task. One is not better than another. Each way gets the task done in the right way for that individual. I will always share my heart with at least one specially-abled dog!